A portrait of education campaigner Malala Yousafzai by Jonathan Yeo is to go on display for the first time at the National Portrait Gallery. The 16-year-old was attacked by gunmen in Pakistan in 2012, following her campaign for girls to have the right to attend school. Yeo said it was an "honour" to paint a portrait of "one of the most inspiring figures of our age". The portrait shows Malala doing her homework and is larger than life-size. It will go on display alongside several previously un-exhibited Yeo portraits of well-known figures, such as Damien Hirst and Kevin Spacey. Malala was shot in the head on a school bus by Taliban gunmen on her way home from school in October 2012. She was flown to Birmingham for treatment and now lives in the city. Yeo first met Malala and her family in April, when she had just started school in the UK and was still recovering from her injuries. He said it was "a great privilege to spend some time with Malala and her family at such a pivotal moment in her life". "Given how much she has already been through and all that she represents to the world, it took a while to adjust to the fact that she is still a very fragile teenager. "Hopefully the painting reflects the slight paradox of representing someone with enormous power and wisdom yet vulnerability and youth at the same time," he said. 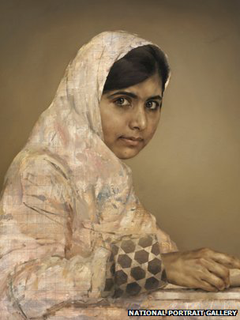 The portrait will be auctioned later for Malala's charity fund, which campaigns for girls' rights to education. The teenager, who has recently been awarded the International Children's Peace Prize, said she was "honoured that the National Portrait Gallery should wish to hang my picture and touched that Jonathan asked to paint me. I think that he has really captured me in the image." "Jonathan has been extremely kind in donating the portrait to The Malala Fund and it is wonderful to know that many children will ultimately be able to benefit from the money raised from its sale," she added.